A family celebrates Día de Muertos, a holiday for remembering those who have passed. 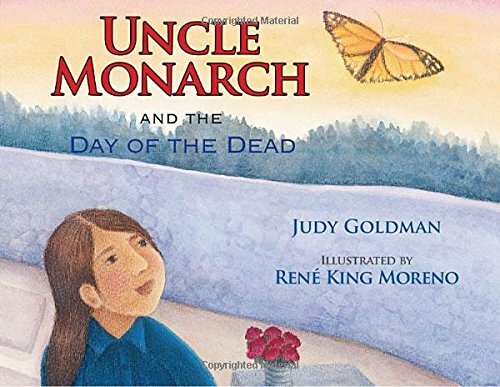 When the monarch butterflies return to her Mexican countryside, Lupita knows that Día de Muertos, "the Day of the Dead," is near. She and her favorite uncle watch the butterflies flutter in the trees. When a butterfly lands on Lupita's hand, her uncle reminds her that she should never hurt a monarch because they are believed to be the souls of the departed. Lupita and her family get ready for the holiday. When the first of November arrives, the family will go to the cemetery to honor the memories of their loved ones. But this year is different—Lupita's uncle cannot join them. Now, Lupita learns the true meaning of the celebration.